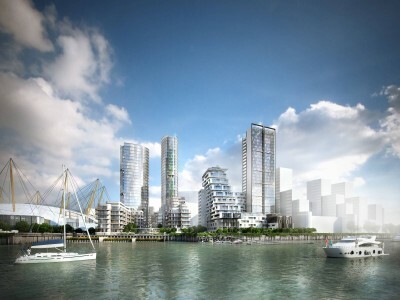 Triangle Fire Systems have been awarded 4 new contracts at Greenwich Peninsula. This includes all 3 plots which comprise the Peninsula Riverside, an area forming part of the Greenwich Peninsula master development. The plots are currently known as M0114, M0115 and M0117. M0114 consists of 3 blocks, Triangle will provide sprinkler protection to the west block and the private flats within the south block. M0115 consists of 2 blocks of which Triangle will protect a total of 64 units which consists of all private flats in North Block and 3 townhouses. Both plots we will be working on behalf of Wates Group. The final block comprising the peninsula riverside is M0117, a GB group development, Triangle will be working on behalf of LJJ Contractors. Triangle will protect floors 2-9 of the south block. The 4th Contract awarded was plot M0101, Platinum Riverside, on behalf of Ardmore Construction. All apartments in the 15 storey high rise will be sprinkler protected. For all 4 plots we will also be supplying and installing dry rising mains.